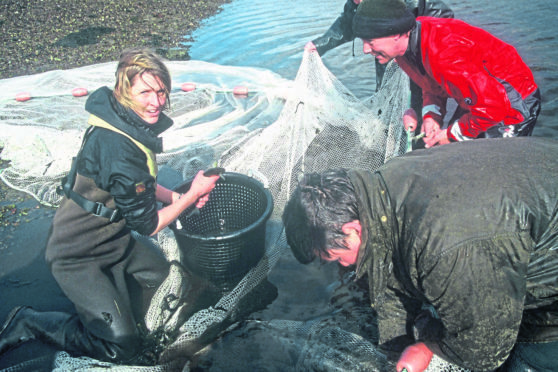 Ailsa Hayes, left, an oyster farmer who handcuts seaweed, described the proposal as fishing down the food chain at its worst. The anger was triggered by a scoping report from Ayr-based Marine Polymers which wants to harvest kelp in waters off the west coast. The proposals are at a very early stage – but local reaction has been strong amid concerns that kelp could be wiped out. The mechanical dredging of wild seaweed in Scottish seas would be a new thing though it has been practised for decades in Norway and elsewhere. The practice has led to serious concerns in Ireland where calls have been made to look the impact. Now a social media post on the matter has been shared more than 2,000 times with almost 1,000 reactions. Ailsa Hayes from Ullapool, an oyster farmer who handcuts seaweed, said: “This is taking out a primary habitat that supports the whole food chain. It is fishing down the food chain at its worst. “The importance of this habitat is so great that I believe allowing dredging at any level is to set a dangerous precedent where profit comes above a healthy coastal environment. But Douglas McInnes, one of the co-founders of Marine Polymers said the company will take a “very green perspective” with low density approach to harvesting. He said: “This report is the result of several years of in-depth research into the critical environmental factors we need to consider before we started this consultation process. Adrian MacLeod from the Scottish Association of Marine Science said care needs to be taken but it is not necessarily a bad thing. He said: “We have a huge resource but before we jump in to harvesting this needs a lot more study to understand what impact is acceptable.